Scientists say they have observed a record-breaking impact on the Moon. Spanish astronomers spotted a meteorite with a mass of about half a tonne crashing into the lunar surface last September. They say the collision would have generated a flash of light so bright that it would have been visible from Earth. The event is reported in the Monthly Notices of the Royal Astronomical Society. "This is the largest, brightest impact we have ever observed on the Moon," said Prof Jose Madiedo, of the University of Huelva in south-western Spain. The explosive strike was spotted by the Moon Impacts Detection and Analysis System (Midas) of telescopes in southern Spain on 11 September at 20:07 GMT. 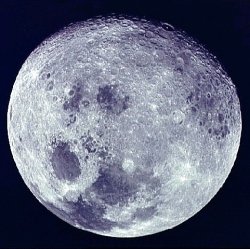 "Usually lunar impacts have a very short duration – just a fraction of a second. But the impact we detected lasted over eight seconds. It was almost as bright as the Pole Star, which makes it the brightest impact event that we have recorded from Earth," said Prof Madiedo. The researchers say a lump of rock weighing about 400kg (900lb) and travelling at 61,000km/h (38,000mph) slammed into the surface of the Moon. They believe the dense mass, which had a width of 0.6-1.4m (2-4.6ft), hit with energy equivalent to about 15 tonnes of TNT. This is about three times more explosive than another lunar impact spotted by Nasa last March. That space rock weighed about 40kg and was about 0.3-0.4m wide.